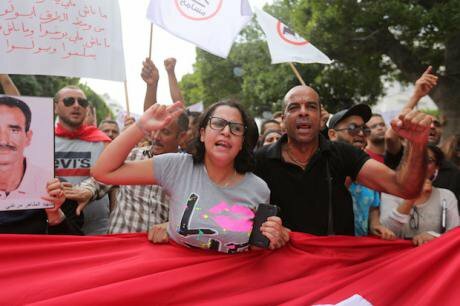 Protesters raise slogans in the march called by the Maniche Msamah campaign (I will not forgive) on Habib Bourguiba Street in Tunis September 16, 2017 after the Tunisian Parliament approved the Administrative Reconciliation Act. Picture by Mohamed Krit/SIPA USA/PA Images. All rights reserved. Tunisia’s parliament passed a reconciliation law in September offering amnesty to former officials of the Ben Ali regime charged with corruption. Supporters claim Law 49, a diluted version of the contested Economic Reconciliation Law that was first introduced in 2015, will allow the country to move forward without alienating past politicians. But the bill entrenches impunity for many of the crimes that sparked the 2011 revolution, and encroaches on the mandate of the existing transitional justice process, which has been working since 2013 to uncover the stories of victims of the regimes and bring perpetrators to justice. Tunisia’s transitional justice process, which has been far from smooth, remains critical to Tunisia's continued democratization. It also includes a number of advances that have serious implications for women in Tunisia and beyond.